Black Dog & Leventhal, 9781579122218, 320pp. A practical and indispensable guide for anyone venturing into the outdoors and backcountry, this classic resource by wilderness expert Branford Angier is packed with illustrated core survival skills and timeless advice. Broken down into four essential sections, Sustenance, Warmth, Orientation and Safety, this useful manual reveals time-tested outdoor skills, including how to catch game without a gun, what plants to eat (full-color illustrations of these make identification simple), how to build a warm shelter, make clothing, protect yourself and signal for help. Pioneering survivalist Bradefore Angier helps you master the great outdoors without modern gear. 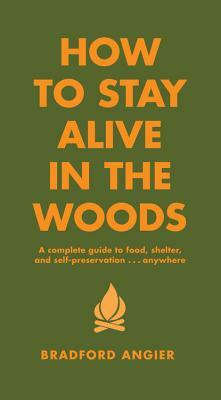 Detailed illustrations and clear instructions offer crucial information at a glance, making How to Stay Alive in the Woods is truly a lifesaver. Bradford Angier (1910 - 1997) was a wilderness survivalist and the author of numerous best-selling books on nature, survival, and living off the land.